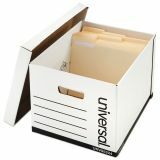 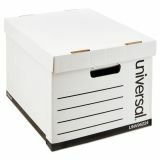 Universal Heavy-Duty Fast Assembly Lift-Off Lid Storage Box, Letter/Legal, White, 12/CT - Extra strength for storage on steel shelving units. Double wall construction on all panels increases stackability. 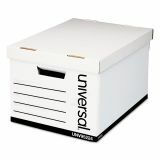 Smooth, rolled edges eliminate paper cuts.